In the previous blog, we showed the top Phillies talent who played in Saturday’s FIL game. These guys impressed us as likely to play someday in the major leagues. Now, we go down a level of players, who it is too early to tell, but they showed promise in the game. The Phillies Instructs have been pitching well. The staff threw 15.2 innings in a row of shutout baseball in the Friday and Saturday games before an Orioles batter went deep with two outs in the seventh inning in Saturday’s game. 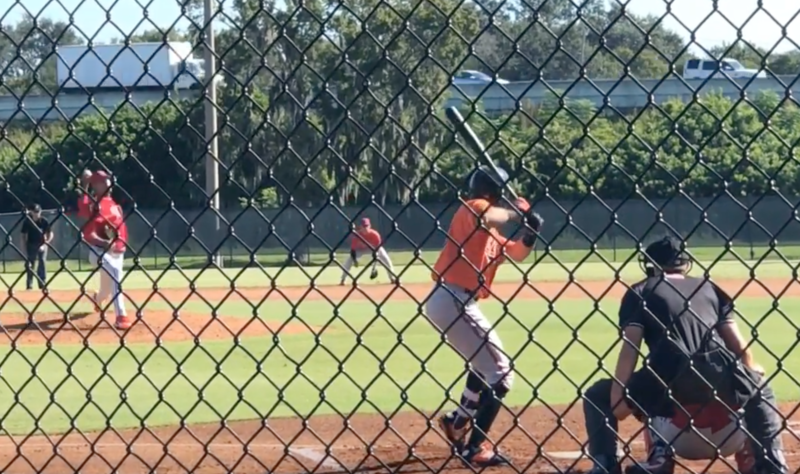 One of the pitchers who caught my attention was 18-year-old, 6’5″, lefty, Gabriel Cotto out of the Puerto Rican Academy. He was a seventh round pick in the 2018 draft. In his two shutout inning, he had a lot of movement on his slider. Saw a little of Steve Carlton in him. Watch two strikeouts HERE. Cotto struggled with his control walking 16 in 15.1 innings in his Gulf Coast League debut this summer. With the bat, several other Phillies Instructs stood out. Corner infielder/outfielder Luke Miller lined a two-run, RBI base hit to left. Watch HERE. He hit .294 over the last ten games he played in the GCL. Catchers Juan Aparico and Freddy Francisco had hard hit singles. Watch HERE. Aparicio hit .339 for the GCL Phillies East team. Francisco hit .342 for the Phillies Red team in the DSL. First baseman Madison Stokes hit the ball hard. Watch HERE. He ended the regular season with Lakewood hitting .325 in his last ten games and had the game winning hit in the only game Lakewood win in the Sally League Championship Series. Instructs end this Friday and the Arizona Fall League opens up on Tuesday night. Phillies baseball never ends! 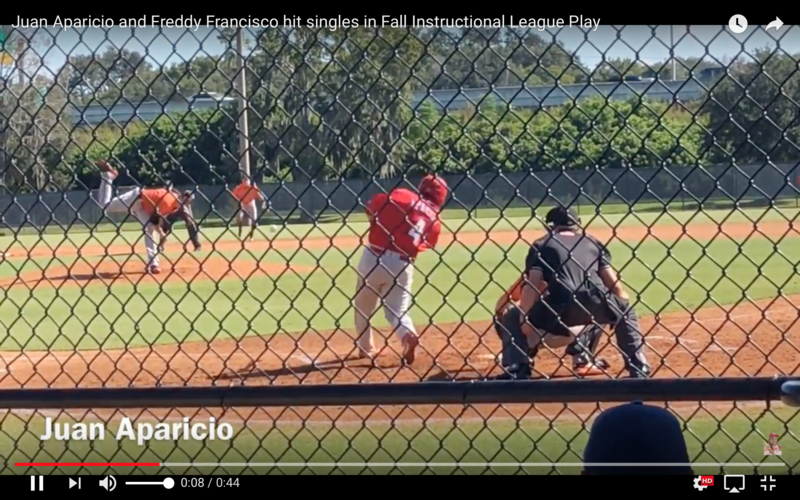 This entry was posted in 2018, October and tagged Fall Instructional League, Freddy Francisco, Gabriel Cotto, Juan Aparicio, Lakewood BlueClaws, Luke Miller, Madison Stokes, Philadelphia Phillies. Bookmark the permalink.